Medical imaging, in its purest form, provides a window on the internal anatomy of the human body. If there is a lesion, such as a cancerous tumour, that alters the shape of the underlying tissues, then the medical image serves as a powerful diagnostic tool. What happens, though, when the pathology manifests itself not as a change in anatomy but rather as an alteration in the underlying function or physiology? This is just what happens with some cancers where the tumour, in its appearance, is virtually indistinguishable from the surrounding healthy tissues – and is therefore effectively invisible on the medical image – and yet can be up to 30 times stiffer than the normal tissue. Now imagine if it were possible to use standard medical imaging techniques to measure the stiffness. Well such an approach, called elastography, does indeed exist and has been implemented using both ultrasound and magnetic resonance. By applying a mechanical compression or vibration, the tumour deforms less than surrounding tissues and then by measuring the deformation, or strain, stiffness may be calculated. 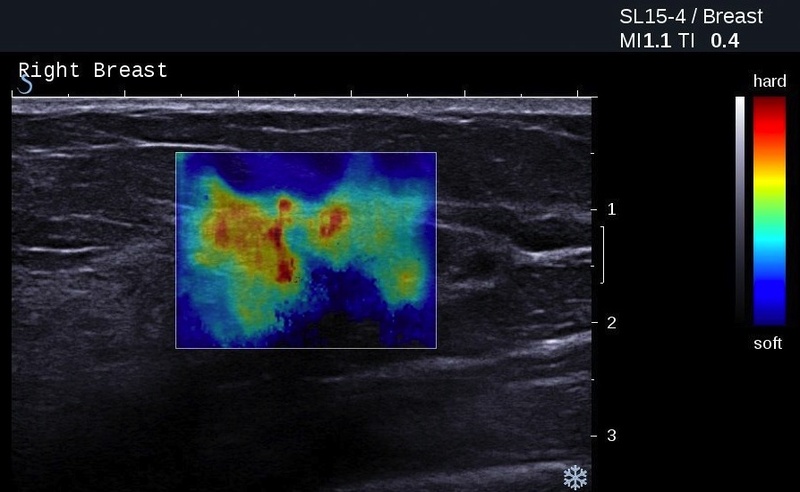 A French company called Supersonic Imagine has developed an ultrasound system that incorporates a novel technique known as ShearWave Elastography to measure stiffness in breast tissue. As illustrated in the figure below, stiffness is represented by a colour spectrum, ranging from dark red (very stiff) through orange, yellow, and green, to blue (very soft). While there is considerable interest in using screening ultrasound to augment mammography, particularly in women with dense breasts, the modality tends to suffer from relatively poor specificity. Supersonic Imagine therefore sponsored an international multi-centre trial of almost 1,000 women and the results have just been published in Radiology. The investigators compared their results using standard B-mode ultrasound with elastography and their analysis revealed a statistically significant improvement in specificity. Importantly, this was accomplished without any loss in sensitivity, a topic explored in last week’s blog. The principal author, Wendie Berg, commented that “We find many low-suspicion lesions on ultrasound that are mostly fibro-adenomas and complicated cysts, which we know are very unlikely to be cancerous, but with standard techniques we cannot be sure without a biopsy. Based on our study it seems feasible that ShearWave Elastography will help reduce unnecessary biopsies”. This is encouraging news for women. Hi kit, what is the impact in accordance with our product?